Symphonic Swing is an exciting orchestral pops show package now available for symphony orchestras everywhere! The show features three different programs that energetically celebrates the sounds of swing music of the Big Bands. The show will transform your audience back to the 1930s and 40s with the music of Benny Goodman, Glenn Miller, Duke Ellington, Artie Shaw, Tommy Dorsey, and more. 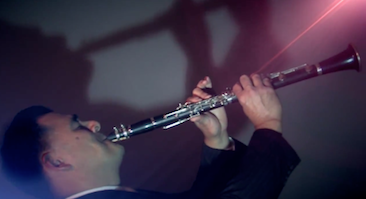 Clarinetist and pianist Tad Calcara, the show’s creator will MC the program and guide your audience through the engaging story of the music of the Big Bands. In addition to the swinging sounds of Calcara’s clarinet and piano, the wonderful vocal talents of Melissa Pace Tanner will evoke the sounds and images of the many great singers of the 1930s and 40s — from Peggy Lee to Ella Fitzgearld. Symphonic Swing’s music has all been beautifully arranged by Tony DiLorenzo. The orchestrations, all based on the originals made famous by the name bands, have been carefully prepared and enlarged for full symphony. The general compliment of musicians needed are typical for symphony pops shows: pairs of woodwinds, 3 trumpets, 3 trombones, 3 horns, 1 alto saxophone, 2 tenor saxophones, 1 baritone saxophone, 1 accustic Jazz bass, and the traditional compliment of strings for pops concert set up. More details are available on request. The Symphonic Swing package also provides the talents of 4 other musicians: Tony Dilorenzo, solo/lead trumpet; Scott Harris, lead alto saxophone; Jay Lawrence, drums; and Glenn Crytzer, guitar. This Symphonic Swing team of players will collaborate with your symphony’s musicians to help produce a memorable evening for your audience. Thank you for your interest in SYMPHONIC SWING!